Use of renewable energy would become more fascinating if there is an option of charging our electric car when being driven. At present these electric vehicles (EV) can have a running range of 30 to 200 miles; it solely depends upon the type of batteries being used in the electric car. There is a limit of using these cars due to the range, as these cars whether being used in city limits or highways need to be parked and slowly recharged overnight before starting again. The short range limits the users to use EVs to commute to work and back on same day or may be short highway trips, and nothing more than that. The big question arises, is there a way so that auxiliary batteries charge the car while the car is moving? The renewal process can be similar to the gasoline run cars where 12V batteries get charged with the electric circuit simultaneously. There could be different mechanism, but what are the options? What kind of generators can be used to power the batteries of electric car when in motion? There could be an option of adding relatively large lightweight frictionless generators to the wheels or axles of the car; these can be fixed on the rear wheels especially for the cars which have front wheel drive. These wheel generators can recharge the batteries without parking the car or can automatically add electricity to the car. These generators will be different than the traditional windmill type fixed on the top of the car. Though it seems somewhat awkward, but can be explored. It can be large squirrel-cage fan installed transversely under the hood parallel to front wheel drive motor. On the each end of the axle will be a frictionless rotating generator which will have same functions as wheel generators. 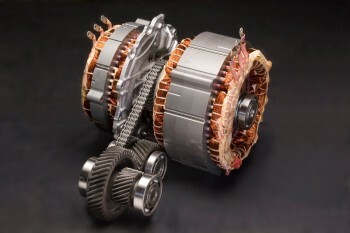 These changes are quite possible due to the size of electric engine which is quite small as compared to gasoline engines, this will provide extra space under the hood, and this can be possible only if the bulky power batteries and the electronic speed controller are fixed in some other part of the car. The use of radiator cooling system and also in some cases transmission may not be required in the electric car which gives extra space under the hood for such an arrangements. 3. 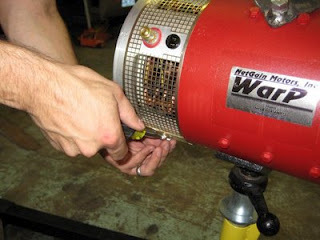 Self-feeding electric motor generator. There can be possibility of fixing powerful generator to the electric motor itself. This can ensure recharging of the batteries if the car is moving fairly in good speed, or alternatively it feed electricity back into the motor. The drawback of differing rotational speeds occurring at the differing lineal speed of the car will have to be addressed to. This arrangement can be used mostly on highways rather on city roads due to speed restriction. The main point here is that generators will not activate before the car has reached at the preset speeds. These are only thoughts but these thoughts are worth exploring and it has to be decided by the automobile engineers if such arrangements can really work. the answer is soo simple, it takes a electric car to recharge a electric car. all sepret systems.1 of the cars are allways being charged.